This design really is something out of the ordinary. 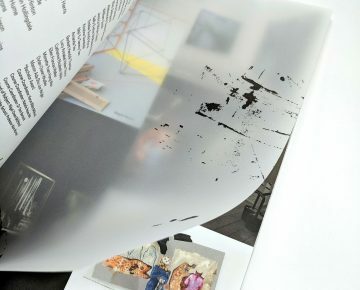 Featuring foiling, spot UV, translucent stocks, a fifth pantone colour, soft-touch lamination, a mixture of coated and uncoated stocks – and a hard deadline. 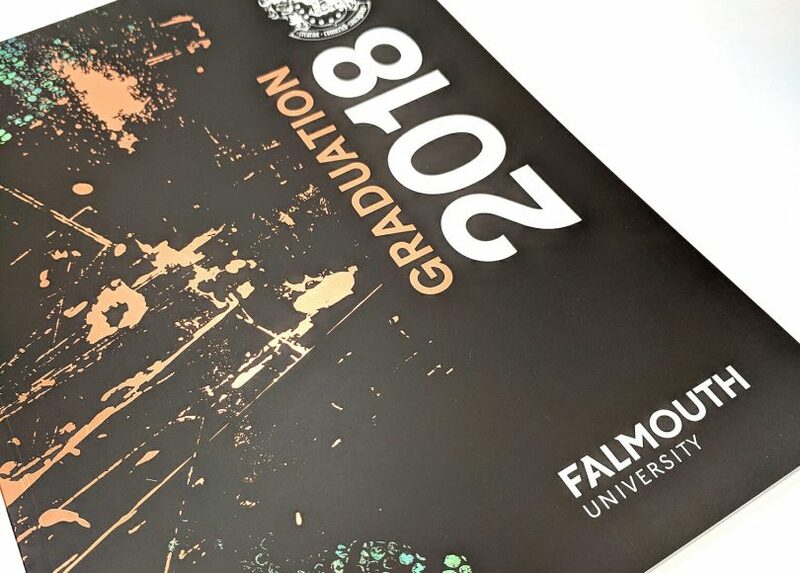 Once again we were asked to print a flagship publication – the Falmouth University Graduation Programme for their week of ceremonies. This publication is not just an informational document – it features examples of work from the students and is intended as a keepsake for each student. Therefore it needed to be versatile but also exude a high level of quality. With such challenges, this calls upon the SAPC team’s years of experience across pre-press, printing, bindery and specialist finishing. Ensuring consistency of colour across different stocks. Multiple specialist finishings including matt lamination, bronze foiling and spot UV. A project like this features a large number of challenges – which is why you need an experienced team looking after it. 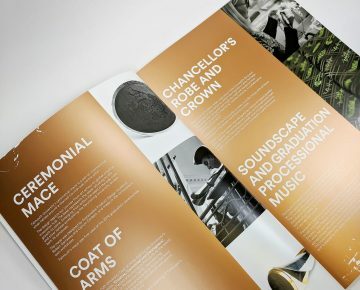 A lot of time and care was taken in all aspects of the manufacturing of the programme, with wet-proofs ensuring the colours matched not only what the designers were expecting but was also consistent across all the different stocks: a matt-laminated cover featured a bronze foil and spot UV, and mixed text pages of coated and uncoated stock – plus interleaved translucent sections. After being perfect-bound, these were delivered directly to the client ahead of the deadline.